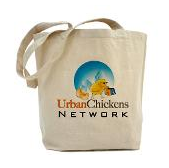 The page is just a start, but now you can become a fan of Urban Chickens on Facebook! Simply visit our Urban Chickens page and click the "become a fan" link. Let's see just how many urban chicken farmers there are on Facebook.